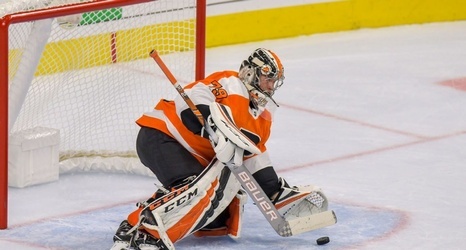 One of the most incredible stories of the 2018-19 NHL season has been the emergence of goalie Carter Hart of the Philadelphia Flyers. Not because a rookie is helping a team resurrect its season -- I mean, Jordan Binnington is basically doing the same thing in St. Louis -- but because Carter Hart is doing this in Philadelphia, a black hole that swallows up goaltenders like the Hellmouth in Sunnydale. It's not just that Carter Hart has propelled the Flyers to within sight of the wild card in the Eastern Conference, as long as they're using some sort of gravitational wave telescope to glimpse it; it's that it appears he might finally be the Franchise Goaltender for whom the Flyers have been searching for roughly three decades.